We are supplier of Stone Vastu Pyramids . Jagdamba Marble Handicrafts is one of the most renowned manufacturers, exporters and suppliers of a supreme quality range of Stone Handicrafts & Accessories, since our inception in the year 1988. 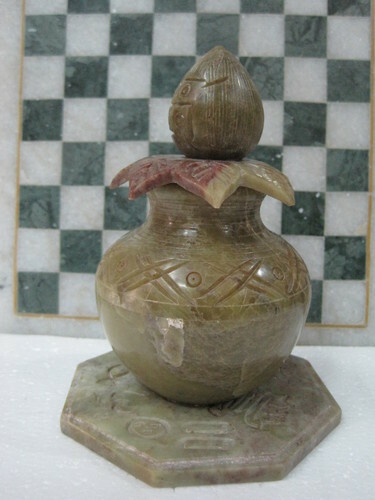 In our range, We offer Decorative Eggs, Soapstone Pill Boxes, Marble Inlay Boxes, Carved Stone Vase Sculptures, Vastu Education Towers and Soapstone Tea Coasters. Moreover, We offer Marble Inlay Elephants, Buddha Tea Light Candle Holders, Black Aroma Oil Burners, Carved Lord Shiva Statues, Soapstone Bath Sets, Marble Taj Mahal, Pooja Shankh and others. These products are carved using genuine quality stone or marble, procured from some of the most authentic vendors of the industry. Moreover, the entire range is designed and carved with the aid of sophisticated tools and equipment. The range of products offered by us is widely liked by men and women of all age groups. Moreover, these products are perfect for gifting purposes as well as personal use. We can also customize these products to meet the exact needs of the clients in the best possible manner. Our range of handicraft products is widely admired for its high aesthetic appeal, fine finish and light weight. To ensure safe delivery at the clients' end, we offer these products to the clients in genuine packaging.